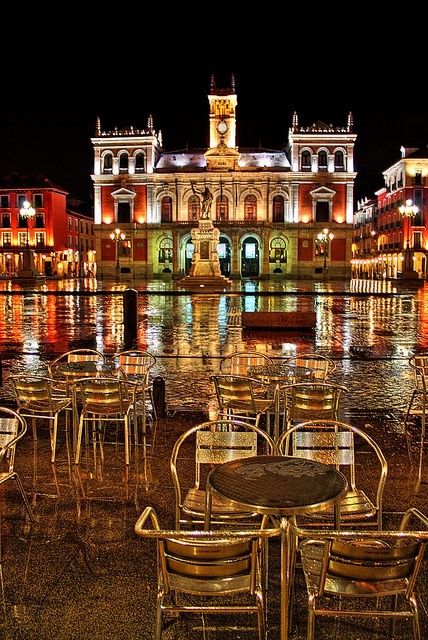 The Plaza Mayor is a central plaza in the city of Valladolid, Spain. It is located only a few blocks away from another famous plaza, the Plaza Zorrilla. The plaza has a rectangular plan with completely arcaded porches which rest on columns or square granite pillars and is of the open type, i.e. the streets leading to it have no hindrance or screen. It is surrounded by narrow streets reminiscent of the past and is one of the largest in Spain. Traditionally the houses of the square had a height of three storeys. The distribution of voids was hierarchical. The first floor had balconies, the second railings, and the third, simple windows. This original appearance was changed over time until all floors had balconies. The Plaza Mayor is presided over by a statue of the founder of the city, Pedro Ansúrez constructed in 1903 by Aurelio Carretero.